Herod Philip, (born 20 BC; ruled 4BC—34AD), was the son of Herod I the Great and his fifth wife, Cleopatra of Jerusalem who he most probably married her as a part of a political alliance, but she was not related to the Ptolemy Dynasty of Egypt. When Herod I the Great died, the Roman Emperor Augustus (27BC-14AD) administered Herod’s will. Philip was assigned to the region east of the Sea of Galilee, which he ruled as tetrarch over the former northeastern quarter of his father’s kingdom – in modern northern Israel, Lebanon, and southern Syria. His half brother, Herod Antipas(4BC-39AD) ruled the balance of Judaea which became a Roman province upon the mismanagement of his inheritance. 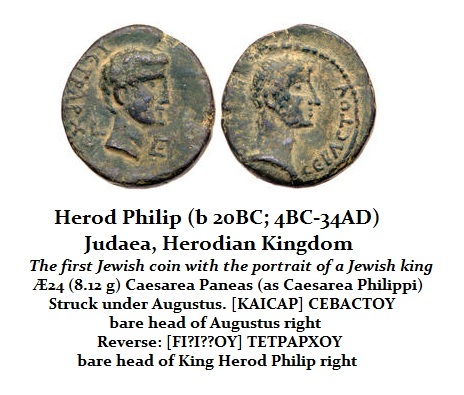 It was Herod Antipas who is referred to in the Bible as King Herod. Herod Philip received the least important share of his father’s inheritance, but he was by far the more responsible rules. In his domain, there were actually very few Jewish subjects. Consequently, Herod Philip pursued a policy of Hellenization. His coinage displays his image along with that of Augustus. He rebuilt the town on the northern shore of the Sea of Galilee, which had been known as Beth-saida, and he renamed it in honour of the Augustus’ daughter – Julias, who was later exiled for her sexual behavior. Late in his reign, Herod Philip married Salome, the daughter of Herodias. This was the girl who was her mother used as a means to entice Herod Antipas to execute John the Baptist. According to the Jewish historian Josephus, Salome was first married to Herod Philip the Tetrarch. After Philip’s death in 34 AD, she married Aristobulus (54-92AD) of Armenia Minor and Chalcis and became queen. 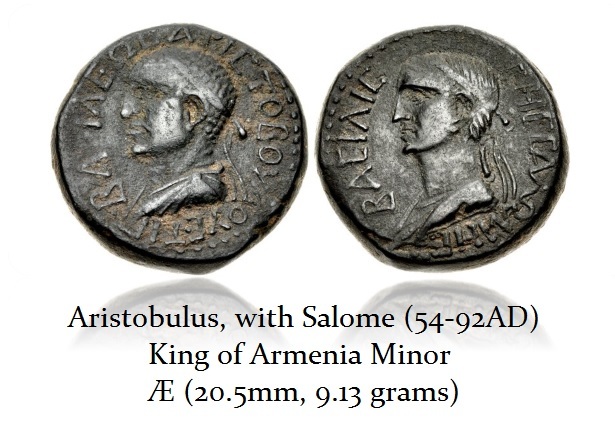 Salome’s portrait has been preserved on the coinage of Armenia Minor.